This preview’s somewhat tricky, as the roles in the bullpen are somewhat undefined, and some of the spots are up for grabs. I’ll try to point out a few key roles and the candidates for them. 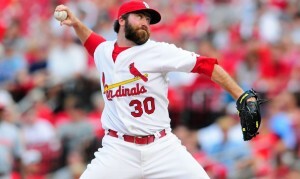 Fortunately for right-hander Jason Motte, Mike Matheny’s quicker to anoint him as the closer than Tony was. The former catcher affectionately referred to as “Apple Sauce” earned closing duties in the twilight of the season and performed admirably, earning nine saves in the regular season and another five in the playoffs. Motte has an explosive fastball (he averaged 96 MPH in 2011), but is still developing his cutter to use in tandem. Last year he mixed it in a lot more, around 20% of the time, and he had his best full season to date, with a 2.25 ERA and a .956 WHIP. Motte’s accuracy also improved, posting his lowest walk rate of his career. This from a guy who can hardly see the catcher at home plate. Motte’s only been a pitcher for six years, so he has less wear and tear on his arm than most pitchers, but his throwing motion could be cause for alarm down the road. Being a former catcher, he has a catcher’s throwing motion (cocking his arm behind his head), and such a violent motion could eventually be deleterious. Should Motte falter in the closing role, Matheny could turn to another righty in Fernando Salas, who led the team in saves last season with 24. Salas doesn’t have dominant speed that most closers do (his fastball averaged 91.4 last season), but he has an effective fastball/slider/change-up combination. He had an excellent 2.28 ERA, but an unusually low .226 batting average on balls in play, so it’s possible his stats could revert closer to the norm this year. Eduardo Sanchez might be the most exciting young arm in the Cardinals’ bullpen. Just 23 years old, Sanchez made his debut with the Cardinals last summer and absolutely dazzled. Sanchez is primarily a two-pitch guy, throwing a fastball that averaged 93.5 MPH and a curveball he threw a third of the time. He struck out 10.5 batters per nine innings, and his ERA of 1.80 was absolutely phenomenal. One caveat though may come in the form of his shoulder, which shut him down for most of the last three months of the season and all of the playoffs. The centerpiece of the Rasmus trade with Toronto was a starter-turned-LOOGY (Lefty, One Out GuY) named Mark Rzepczynksi, affectionately referred to as Scrabble. Scrabble’s numbers with the Cardinals weren’t great overall (0-3, 3.97 ERA), but he was dominant against left-handed hitters, holding them to a .163/.256/.221 slashline. Look for him to be the primary pitcher against tough lefties this season. Mitchell Boggs is another flame-throwing righty who tried his hand at closing early in the season last year. He began his career as a starter, but spent the last two seasons working exclusively out of the bullpen. After his demotion from the closer spot Tony seemed to lose a bit of confidence in him, but he still contributed in the post-season run. Like Motte, he throws in the mid-to-upper 90’s and has a slider he throws around 20-25% of the time, mixing in a very rare changeup that’s clocked at around 87 MPH. At one point considered a weakness last season, with several pitchers floundering in the first half (Ryan Franklin, Trever Miller, Brian Tallet, Miguel Batista), the trade with Toronto/Chicago brought over Scrabble and Octavio Dotel, and the acquisition of Arthur Rhodes brought in another proven lefty. This year, the bullpen has the potential to be one of the most underrated strengths of the team, with the aforementioned relievers in line for bullpen spots. The Cardinals acquired a few other free agents to compete for spots, including JC Romero (another LOOGY whose splits against left-handed batters are MUCH better than against righties) and Scott Linebrink, at one point a dominant set-up man for the Padres who spent last year with the Braves. If the Cardinals rotation can get the ball to the bullpen with a lead, they should be in good shape. Phew. A month after I started, I finally finished my preview. My thanks to the three of you who read the whole thing start to finish. I’ll be posting updates at least on a weekly basis, hopefully more throughout the season, but my next few posts will hopefully be on the Blues and their incredible run thus far.